Mentoring Design and Technology (D&T) in the Secondary School is a practical guide for mentors of beginning teachers, whether trainee, newly qualified or just those who suddenly find themselves teaching the subject for the first time. 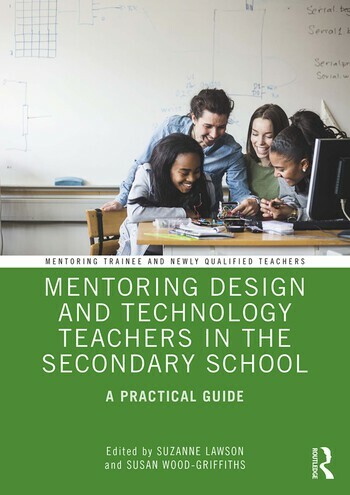 This evidence informed book takes the views of leading design and technology educators and practitioners to provide tried and tested strategies to support mentors in their role. From definitions to practical guidance on lesson planning, learning conversation to risk taking and dealing with practical lessons. Helping new D&T teachers appreciate the fundamental nature of design and technology and how this informs both why it is taught and how it is taught. Understanding yourself – beliefs, values and attitudes. How your experiences influence your approaches to teaching. Observing design and technology teachers’ lessons: tools for observation and analysis. Risk taking in the classroom – moving teachers forward from pedestrian to innovative practice. Filled with practical strategies to engage and develop mentoring skills Mentoring Design and Technology Teachers in the Secondary School offers advice and guidance to support mentors in developing inspirational D&T teachers of the future. CHAPTER 3 WHAT KNOWLEDGE, UNDERSTANDING AND SKILLS DO MENTORS OF NEW D&T TEACHERS NEED? CHAPTER 5 HELPING BEGINNING DESIGN AND TECHNOLOGY TEACHERS TO ANALYSE AND DEVELOP KNOWLEDGE, SKILLS AND UNDERSTANDING OF FOOD PREPARATION AND NUTRITION. CHAPTER 10 OBSERVING DESIGN AND TECHNOLOGY TEACHERS’ LESSONS: TOOLS FOR OBSERVATION AND ANALYSIS. CHAPTER 12 RISK TAKING IN THE CLASSROOM – MOVING TEACHERS FORWARD FROM PEDESTRIAN TO INNOVATIVE PRACTICE. CHAPTER 13 - A STAKEHOLDER VIEW OF MENTORING – REFLECTIONS FROM THOSE WHO MENTOR AND HAVE BEEN MENTORED. WHAT LESSONS CAN BE LEARNED? Suzanne Lawson is the PGCE secondary course leader at the University of Worcester. Previous to this she worked as a senior lecturer at Birmingham City University. She has fourteen years teaching experience working in a range of schools in the UK with a further 15 years experience in teacher training. Sue Wood-Griffiths was the PGCE Secondary Design and Technology subject leader at the University of Worcester until 2018. Before moving into Higher Education, she taught for 21 years in the UK and overseas. Sue has worked with many teachers and aims to develop innovative, creative teachers who share ideas and take ‘intelligent’ risks.